It is difficult to categorise Kirill Gerstein. He is a young Russian pianist, yet he has spent much of his life in the US, and his playing shows little of the heavy-handedness of traditional Russian piano technique. Just as interestingly, he is a pianist who takes nothing for granted in his interpretations, and his readings of the Schumann and the Liszt here bring new life to some old warhorses. But the paradox is that he manages to do this without resorting to extremes, and if anything his performances are more faithful to the dots on the page than those of most of his predecessors. That approach makes for a very saleable artist, and I suspect we are going to be hearing a lot more about Gerstein in years to come. Schumann's 'Humoreske' Op.20 is presented with delicate precision. For Gerstein the title is a licence for a light, brisk reading. I wouldn't say it is humorous as such, and the focussed energy in each phrase speaks of an earnest concentration on the details and the shape of the music. But there is plenty of life here and plenty of contrast too. As with all the works on this disc, the overall impression is of discipline without restraint. It is Schumann in a classical mould, and it is no worse for that. 'Ophelia's Last Dance' was written by Oliver Knussen for Paul Crossley in 2004, but receives its première recoding here. The music is quite conservative in style, the textures are almost impressionistic, constantly moving between transient tonalities via unpredictable chromatic shifts. It isn't Knussen's greatest work, nor his most interesting, but its inclusion on this programme is inspired. Firstly, it fits a stylistic link between the Schumann and the Liszt, especially the way that its closing phrases segue seamlessly into the opening of the B Minor Sonata. And secondly, the music is the ideal vehicle for Gerstein's pianism. The are no extremes here of dynamic or emotion, but the exploration of the musical middle ground is detailed and subtly variegated. This is exactly where Gerstein excels, and the patient precision of his technique brings out the best in Knussen's music. The B Minor Sonata puts Gerstein's musicianship in perspective. He is clearly a talented pianist, but his temperament is so far removed from that of Liszt that there is a constant battle going on here between the performer and the composer. That's not such a bad thing, and it puts this well-known work in a completely new light. As with the Schumann, the over-riding impression is of absolute loyalty to the notes as they appear on the page. Gerstein does nothing that is not prescribed, although given the amount that is prescribed that doesn't mean the performance is in any way stilted or pedantic. Where other pianists would pull right back in the build up to the massive climaxes, or add caesuras between the sections, Gerstein goes for a more disciplined approach. To pull that off you need exceptional technique, which Gerstein clearly has, and his focus on the details of the textures produce some remarkably clear and lucid results. 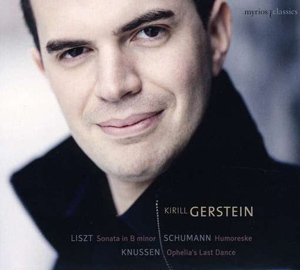 The sound quality is good, and the clear, strident sound of the Steinway piano is ideal for Gerstein's focussed technique. The cover claims that the recording was made in DSD, although I don't know how significant that has for a disc that is not being released as an SACD. In fact, Gerstein would be the ideal candidate for the full SACD treatment; the clarity he injects into every single texture would make an SACD of these performances something very special. No complaints though about the CD quality sound, which is lively and engaging. A promising album from a pianist who clearly has much to show us about the music we think we already know.